Two days after residents on New Hampshire's seacoast were startled out of bed by the unusual sound of F-16 fighter jets, people are gathering at Pease Air Force Base for a rare opportunity to see them take off for their home base in Italy. "It's pretty cool," said seven-year-old Jake Humphrey of York, Maine. With a model F-16 in hand, he's ready for departure. "They just rumble everything," he said. He and his family are trying to catch a glimpse of the six fighter jets now parked at Pease Air Force Base in Portsmouth. "When you hear them, it's a distinctive sound," said Jake's dad, Peter Humphrey. The sound startled people awake early Wednesday morning. "Oh yeah, it shook the house," said Barrington resident Casey O'Brien. "It just rumbled everything coming through, it was pretty neat." A National Guard spokesman tells us the six jets were on their way home to a US Air Force Base in Italy when they were unexpectedly diverted to Pease because they were having trouble refueling. "It was pretty surprising," said Kensington resident Kate Mignone. "It was definitely loud enough, I mean we're 15 miles away from this area and we could hear it." The jets' unscheduled pit stop, reason enough for little Jake to dream big. "I want to fly through the clouds," he said. And a chance for his dad to honor those in the cockpit. "It is definitely the sound of freedom," Humphrey said. "It makes you feel good, they're still in the area, makes you feel safe." 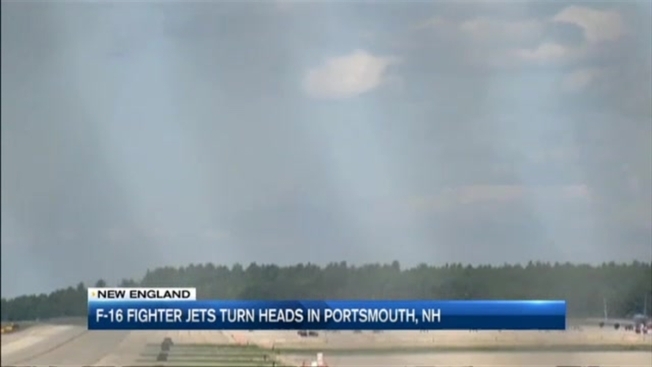 Seacoast residents should be prepared for more loud noises as the jets take off. Officials say that is expected to happen sometime Friday night or Saturday.